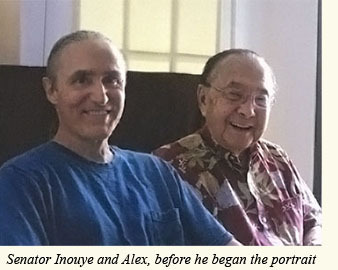 Toward the end of his life, Senator Inouye developed a great appreciation for Alex's artwork after viewing many of his paintings at a private showing. The Senator seemed to especially appreciate the unusual level of labor-intensive detail in Destination and other works. Eventually, the Senator posed for a formal portrait, which Alex began from life and completed later in his studio. The Senator posed in a variety of positions, but Alex chose to depict him from a nearly straight-on viewpoint, with uniquely angled lighting that he felt best reflected the Senator's personality. The portrait is on canvas, and painted entirely with only two brushes (a number ten round bristle brush, and a number six round sable) and six colors. It's one of the larger portraits Alex has painted over the years, with the Senator's face measuring about 18 inches from top to bottom, and the entire painting considerably larger. When the portrait was completed, the Senator's wife Irene visited Alex's studio for a private unveiling. Later, Alex officially unveiled the work to about 80 of the Senator's closest friends and relatives at Harbor View Center in Honolulu. The portrait was extremely well received, with those closest to the Senator expressing strongly positive and heartfelt reactions. One of the most frequent comments we heard was that it perfectly captures his essence. We appreciate all the inquiries we've received about this portrait. A limited number of large prints on canvas, as well as smaller prints, are available. To order, please contact us. A video of Alex discussing the Senator's portrait on the news is now posted online. (Hawaii News Now visited his studio, and he was interviewed for this story by news anchor Tannya Joaquin.) Click here to watch the video.